Are you looking for interest free carpet or a cheap flooring option? Then we have got some good news for you. Finding a the best deal on cheap carpet installation has never been easier. When most people hear about cheap carpet, they think the products are made from cheap materials. The Carpet Guys offer low payments starting at $95.00 a month with flooring options second to none including some of the highest quality carpet, vinyl, hardwood and laminate flooring available. Basically, you would be paying two dollars a day to have all of your flooring replaced. Otherwise a new carpet installation typically runs from $800 - $5,000+ for average sized homes. Very cheap carpet is not out of reach. Here at The Carpet Guys, we believe everyone should be able to experience the joys that new carpeting can provide. 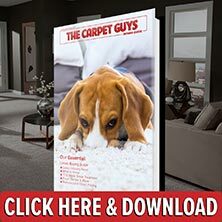 Anyone looking for cheap carpet will be suprised to know that even the lowest priced flooring we offer comes with a lifetime installation warranty. Did you know that new carpeting can help rid your home of pesky allergens that may have settled on the existing carpet? It’s true. Not only are you saving money on top quality products, you’re increasing the health of your home and family too! We want to help provide a happy and healthy home environment that you will enjoy for years to come at an affordable price. Get the cheap flooring options you have been looking for today. How about that vacation you have been dying to take? Take advantage of our carpet financing plan, make a small monthly payment, and spend it on the things that matter most to you. Buying new carpet does not have to be impossible. With The Carpet Guys, fresh and new carpeting is only a phone call away. For more information, schedule a free in-home flooring estimate or give us a call to get started. We look forward to serving you.